Eastin Ashby goes up with a shot against Coast Guard junior guard Jill Bray. Maya Savino plays point in Emerson's Wednesday loss to Coast Guard. Charlie Boyle puts up a layup. She scored 10 points on the night. 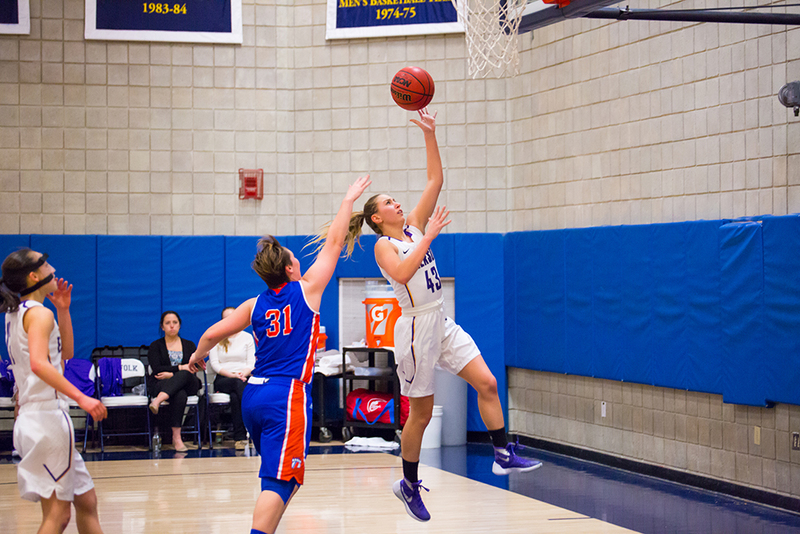 Even with the possibility of a place in the NEWMAC playoffs on the line, and a final push led by sophomores Charlie Boyle and Natalie Busch, Emerson’s women’s basketball team couldn’t keep up with the Coast Guard Bears Wednesday night. Coming into the game, the Lions were eighth in the conference. In order to keep their playoff hopes alive, the game was a must-win. But in the words of head coach Bill Gould, the team’s focus on winning was the problem. “We tried too hard to win, as opposed to just try to play,” Gould said. The 63-50 final was hard for the team to swallow, as the Lions came into both halves swinging but eventually lost momentum. Shots weren’t sinking into the basket, reducing their field goal percentage to 27.5, as well as bringing down team morale, Gould said. While the Lions were neck and neck with the Bears in the first six minutes, rebounds and missing shots eventually caught up to them. They ended the first quarter down 12-8, but Coast Guard went on a 12-2 run in the middle of the second quarter to widen its lead. Following a timeout after the final point of that run, Emerson started a brief rally after an Elizabeth Horan 3-pointer. But the buzzer sounded on the first half, and Coast Guard led 32-19. A more manic, fiercer team emerged from the locker room for the second half. Its play quickly got physical, and the Lions saw some success led by Busch, the Beacon’s deputy arts editor, and Boyle, with 14 and 10 points for the night, respectively. Emerson (11-13, 4-11) couldn’t quite complete the comeback, and fell to Coast Guard (10-14, 7-8) for the second time this season. Junior forward Sierra Ducey said that the team was looking forward to this game to solidify NEWMAC competition, especially with the interesting week the team has had. The basketball teams as well as the volleyball team haven’t been able to practice in the Bobbi Brown and Steven Plofker Gym for the last week due to a sprinkler that was damaged earlier this month, and all teams have been forced to relocate practices and games. The home game against Coast Guard was played at Suffolk University’s Regan Gymnasium. The women’s basketball team plays its final game of the season against Smith (17-7, 9-6) this Saturday at 4 p.m., which will also be played at Suffolk. The Lions will honor Horan, their lone senior. Natalie Busch, deputy arts editor, did not contribute to this piece.